Her pizza face turned out a little creepy, lol, but she thought it was hilarious. 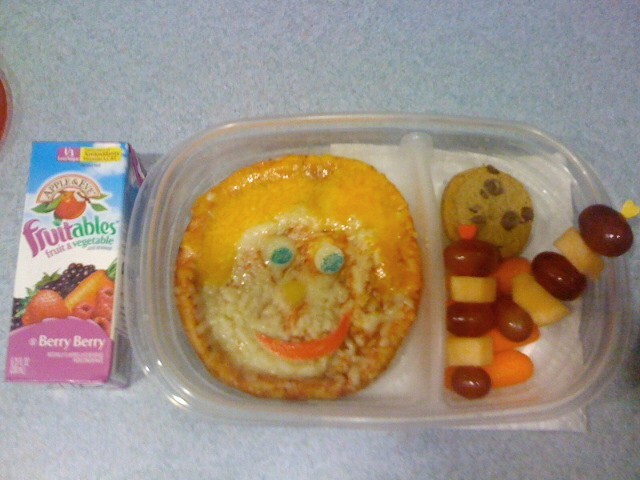 I used shredded cheddar before heating to melt for his hair, and little pieces of provalone cutouts for this facial features (or lack thereof) coloring them in with my food writers after it was heated. There are two picks of grapes & cantalope dices. Under that are 4 baby carrots. Choc chip cookie for dessert. Little Miss's birthday party is this weekend so I am a busy bee today and tomorrow AM *AHHH* getting everything finished & ready. Can't wait to share some of the fun food and crafts! The nickname 'Pizza Face' is nice in this context! LOL! Pizza Face is very handsome. Does he have an older brother? LOL!